The independent high-level panel established to take stock of the Kyoto Protocol's Clean Development Mechanism (CDM) has released its eagerly awaited recommendations by urging nations to intervene forcefully to address the crisis in the carbon market and substantially increase their level of ambition when it comes to reducing greenhouse gas emissions. 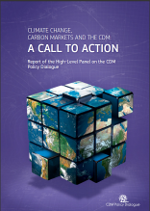 According to the high-level panel, if nations permit the CDM mechanism to disintegrate, the political consensus for truly global carbon markets may evaporate. Therefore, the panel calls on nations not only to increase their mitigation ambition but also to investigate the establishment of a new fund to purchase and cancel part of the current overhang of emission allowances held by countries her under the Kyoto Protocol. To address shortcomings and improve the mechanism's reputation and performance in the future, the Panel recommends fundamental reforms of the CDM's operating procedures. In formulating its recommendations, the high-level panel commissioned a wide-ranging research programme addressing 22 topics across three main areas: the impact of the CDM to date; the governance and operations of the CDM; and the future context in which the CDM could operate. It also organized a stakeholder consultation programme holding dozens of formal and informal meetings around the world. The panel, which officially presented its report at the sixty-ninth meeting of the CDM Executive Board in Bangkok, urges that its recommendations be implemented fully and without delay with a timetable agreed that will bring them into effect by the United Nations Climate Change Conference scheduled for December 2013. Mr. Xie Zhenhua, the vice chairman of NDRC, China. Mr. Jos Delbeke, Director General for Climate Action, European Commission. Ms. Katherina Reiche, Parliamentary State Secretary for Environment, Germany(das Link).